Canopy has an iPhone case with a twist, but this time it is a really useful twist, not just more of the same with a new patina. 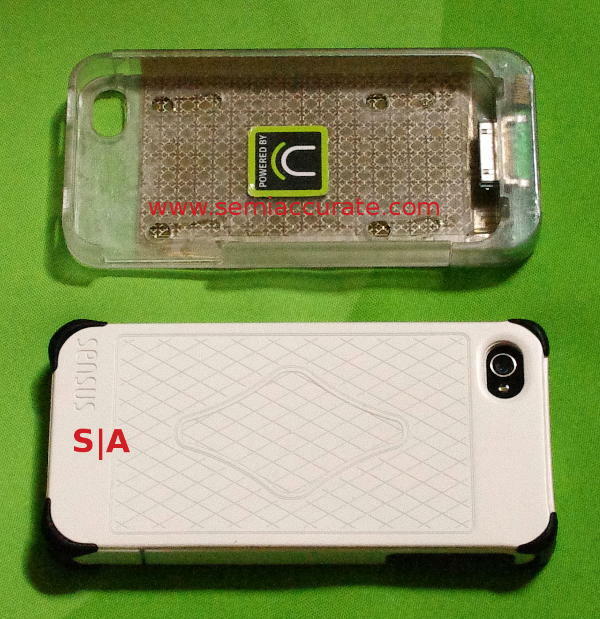 This new case is called the Sensus and it incorporates a capacitive touch sensor. The case itself looks like many of the other iThingy cases out there but it has an Apple patented(R)(C)(TM)(P)(B) licensed (C)(R)(TM)(P)(S) connector on the bottom to actually interface with the phone. Instead of a simple battery, this connector transfers actual data from the two capacitive touch panels on the back and top of the phone. It looks like this. As you can see, the sensor basically mirrors the screen area on the bottom and also runs along one side. This gives you the ability to use the back of the phone for input and the top side as shoulder buttons without blocking the screen. Canopy has a full API for the Sensus, but at its most basic level it can just mirror inputs on the back of the screen to the front. If a dev implements the Sensus API fully, it can be a lot more, secondary controllers or more buttons are the obvious choices, use your imagination for more. What is Apple doing at 14nm?